There are 54 Assisted Living Facilities in the Melbourne area, with 22 in Melbourne and 32 nearby. The average cost of assisted living in Melbourne is $3,106 per month. This is lower than the national median of $3,346. Cheaper nearby regions include West Melbourne with an average starting cost of $2,750. To help you with your search, browse the 320 reviews below for assisted living facilities in Melbourne. On average, consumers rate assisted living in Melbourne 4.0 out of 5 stars. Better rated regions include West Melbourne with an average rating of 4.2 out of 5 stars. Caring.com has helped 16 families in Melbourne find high-quality senior care. To speak with one of our Family Advisors about assisted living options and costs in Melbourne, call (855) 863-8283. Winnifred Assisted Living Facility Inc.
Melbourne is in Brevard County on the east coast of Florida, north of Palm Bay. Seniors in Melbourne may enjoy tours of Kennedy Space Center and annual festivals like the Independent Filmmaker's Festival, Arts Festival, Aviation Day and Oktoberfest. Melbourne is also home to 22 assisted living facilities with another 11 in nearby cities, including Palm Bay, Satellite Beach and Merritt Island. The Florida Bureau of Health Facility Regulation licenses several types of assisted living facilities in Melbourne and throughout the state. The American Lung Association gives Melbourne an A grade for both ozone and particle pollutants, which means that seniors with respiratory conditions shouldn't worry about air quality worsening their symptoms. With 8.23 violent crimes per 1,000 residents per year, Melbourne's violent crime rate is more than double the national average. Property crime is also much higher than state and national averages. The sales tax in Brevard County is 7 percent, but the state doesn't impose an income tax on income, including pensions and SSI benefits. Seniors coming from out of state may find extra breathing room in their budgets. In addition to lower taxes, Melbourne residents enjoy a cost of living that's 8 percent lower than the national average. Melbourne's summers are humid and lengthy. Summer highs are typically in the upper 80s and lower 90s with frequent thunderstorms. Winters are short and mild with average lows in the 50s. Daytime temps in the 70s are not uncommon in the winter. Melbourne has an array of community resources for seniors, including the SAIL program, an organization that provides educational classes and fitness programs, as well as Brevard's One Senior Place, a network of senior centers throughout the county. Assisted Living costs in Melbourne start around $3,106 per month on average, while the nationwide average cost of assisted living is $4,000 per month, according to the latest figures from Genworth’s Cost of Care Survey. It’s important to note that assisted living rates in Melbourne and the surrounding suburbs can vary widely based on factors such as location, the level of care needed, apartment size and the types of amenities offered at each community. 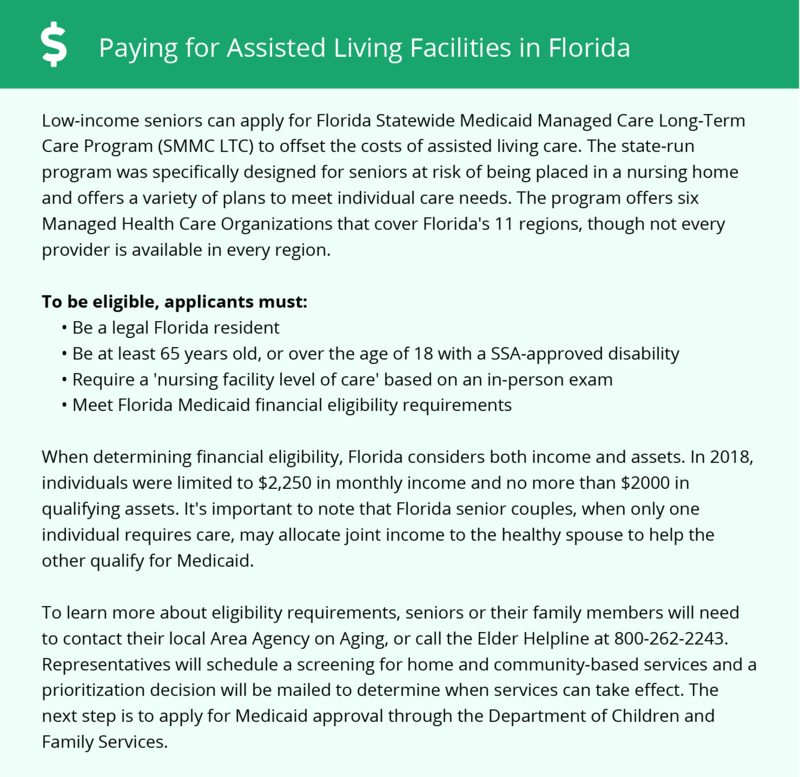 Low-income seniors can turn to Florida's Medicaid Long-Term Care or Assistive Care Services program for help with the cost of services at assisted living facilities. These programs don't cover room and board, but the MLTC plan does negotiate fees with the provider. For further help, residents receiving Federal SSI benefits can apply for optional state supplementation or consider family supplementation, which the state allows. Melbourne and the surrounding area are home to numerous government agencies and non-profit organizations offering help for seniors searching for or currently residing in an assisted living community. These organizations can also provide assistance in a number of other eldercare services such as geriatric care management, elder law advice, estate planning, finding home care and health and wellness programs. To see a list of free assisted living resources in Melbourne, please visit our Assisted Living in Florida page. Melbourne-area assisted living communities must adhere to the comprehensive set of state laws and regulations that all assisted living communities in Florida are required to follow. Visit our Assisted Living in Florida page for more information about these laws.